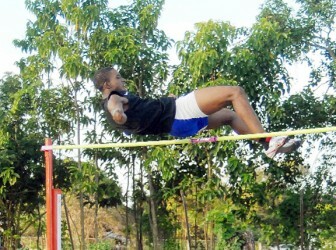 Defending Schools National Champions, North Georgetown (District 11) began their stringent selection process yesterday with their inter-zone field events for the upcoming Schools National Championship slated for next month. Inter-Guiana Games (IGG) basketball selectee, Neil Gordon proved that he is not only capable of scoring in basketball but also displayed his athletic prowess leaping away with the boys under-20 long and high jumps. 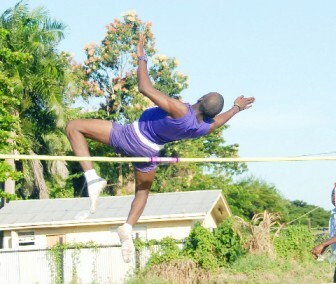 Gordon’s natural ability allowed him to leap a distance of 6.1 metres to take the top position in the boys’ long jump. He then soared to a height of 2.00 metres to win the high jump. Yekini Favourite also displayed the ability to leap to great heights as he jumped away with the boys’ under-18 high jump with a distance of 1.92 metres. Favourite also excelled in the under-18 boys’ discus claiming the top position with a throw of 28.32 metres. He also participated in the boys’ under-18 javelin but fell to another basketball star and IGG national selectee Lorenzo Bethune. Bethune won the boys javelin with a distance of 41.68 metres while Favourite threw his way to a second place with a distance of 38.50 metres. The boys’ under-18 shot put event was an entertaining feature during the day’s event when national cricketing all-rounder and former national sprinter Kareem Naughton held the lead for the majority of the event with a throw of 9.68 metres before Walter Roberts surpassed him with a throw of 9.88 metres. Malachi Williams was also impressive in the under-14 category gaining a field double by winning the shot put and discus events with throws of 7.30 and 24.42 metres respectively. On the distaff side, the Daniels sisters ruled the long jump pit as Shaquan Daniels took the under-16 girls’ category with a jump of 5.09 metres while her sister Shemaine Daniels easily won the under-18 category with a jump of 4.47 metres. Seasoned campaigner Juanita Hooper also looked good in the long jump pit as she won the girls under-20 category with a jump of 4.8 metres. Natesha Seymour was unstoppable in the girls under-14 category as she picked up a field triple winning the shot put, discus and javelin events with throws of 5.5, 18.31 and 15.72 metres respectively. Nikita Narine proved to be a top candidate for selection as well with her performance in the under-18 girls’ shot put and discus events with throws of 5.47 and 17.00 metres respectively.